At Whisky Live 2018 in Singapore, the Gordon & MacPhail booth is a great opportunity to sample fine whiskies and then possibly select one that might make it home to Mumbai for others to try. 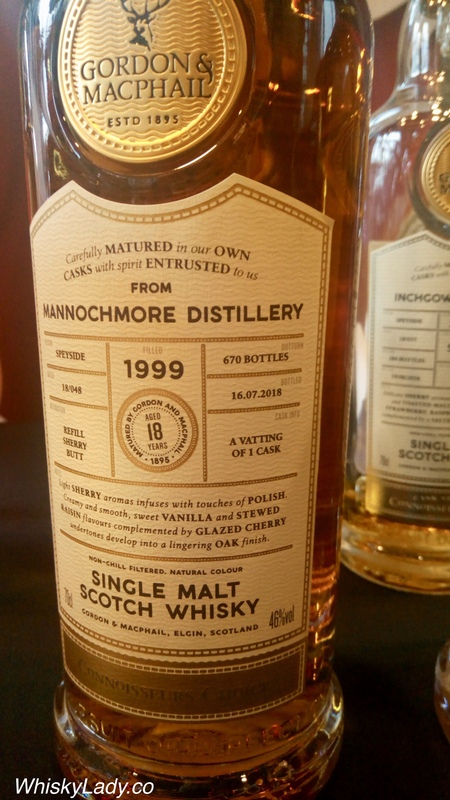 The Mannochmore was very much in the running given our Mumbai tasting group’s haven’t yet sampled a whisky from this distillery. This whisky is part of their Connoisseurs Choice range and I had only a small “speed date” style sniff and swish to discover a feel for the dram. There was no doubt it was matured in a sherry cask… It certainly was interesting. But was it one to bring back to Mumbai? I had only a wee nip for a passing impression – enough to know would like to revisit yet also sufficient to prefer to pick up in a less pricey market. At La Maison du Whisky in Singapore, it would set you back SGD 299. Nose – Full and fruity; aromas of stewed raisins soaked in Sherry, reminiscent of light fruitcake. Sweet marzipan notes complemented with creamy chocolate orange undertones. Taste – Full-bodied and warming; winter spices mingle with indulgent dark chocolate and clove studded orange flavours. Hints of rich plum jam and dark brown sugar lead into candied cherries. Finish – Hints of tobacco and liquorice linger, fading into oak. This entry was posted in Scotland, Speyside and tagged Gordon and Macphail, Mannochmore by Carissa Hickling. Bookmark the permalink.